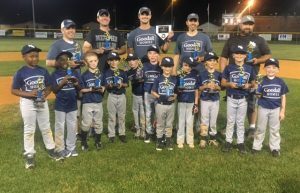 (The Wilson Post: Click HERE for full article) The Goodall Homes Grizzlies won the Lebanon Youth Baseball 7 & 8 year old championship on June 9. The Grizzlies were the ninth seed out of ten teams going into the tournament and won four games to clinch the championship. Pictured left to right are, front row, Jamar Turner, Jarius Keeley, John Schwarz, Braylin "Spud" Caruthers, Eli Moore, Jack Walker Beasley, Lukas Etheridge, Jack East, Sam Walden, Kameron Harrell, and Turner Davis. Back row, coaches Brad Davis, Kent Beasley, Head Coach Nathan East, David Walden, and Aaron Moore. Not pictured is Cason Mull.